One of the consequences of installing the the slide bearings is increased vibration of the Y-axis belt. This leads to very interesting but disturbing patterns on the printed pieces. From my experience with the Sells Mendel I designed a parametric belt tensioner to manage belt vibration and tension problems. If you happen to have vibration on the Y-axis belt, just take some bearing fitting your belt width, pick the corresponding screw, washers and nut, enter the parameters into the SCAD file and print this thing two times. 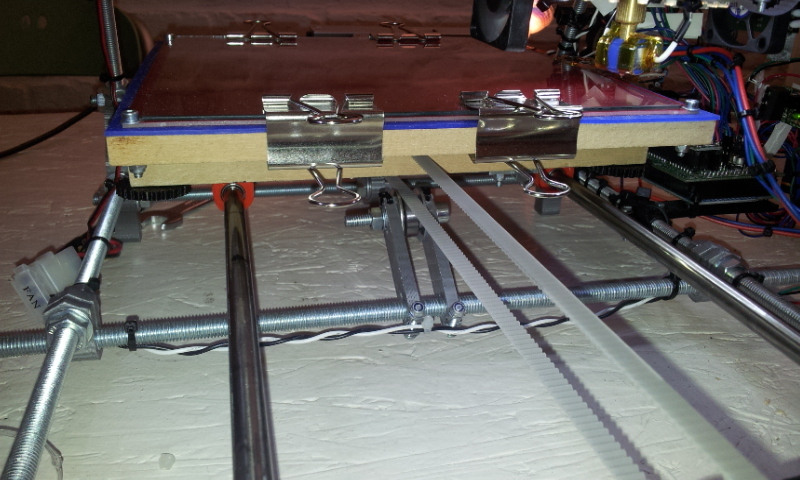 It attaches to the bottom threaded rod in the Prusa Mendel and is held in Place by two M3 screws. Have fun & successful printing!